Visiting Channel Islands National Park should be on everyone’s bucket list. This island destination off the coast of California offers world class kayaking, tranquil camping and several hiking options for outdoor enthusiasts. If you are unsure how to plan your day to the island, you should know about a few of the great options on the island. 1) Sea Cave and Ocean Kayaking – With amazing coastal bluffs and some of the largest sea caves in the world, the Channel Islands are a great place to go kayaking. Scorpion Anchorage is one of the most popular areas of the park for kayaking because it offers several sea caves to explore and has easy access to the water. Prisoners Harbor is another popular destination. Guests can see areas of Santa Cruz Island protected by the Nature Conservancy, offering amazing marine and wild life. 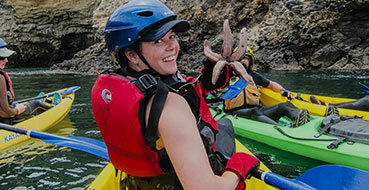 You can look at all our Channel Islands Kayaking options on at Channel Islands Kayaking. Depending on the season, guests can also explore Painted Cave which is one of the largest sea caves in the world. 3) Snorkeling – If you are on a Santa Barbara Adventure Company Tour then your guide will provide wetsuits and snorkel masks as a complimentary service when you book a kayaking trip, but you can also bring your own equipment. The area surrounding the island is a Marine Sanctuary and full of healthy kelp forests teaming with sea lions, fish and crab. 4) Bird Watching- Channel Islands National Park is recognized as an important breeding and resting area for a variety of landbirds, shorebirds, and seabirds. Channel Islands Bird Check List The area is an essential feeding and nesting ground for many sea birds and is home to the only breeding colony of California Brown Pelicans in California! 5) Photography- Don’t forget your camera if you are planning a trip to the Channel Islands. There are numerous places to snap photos of the bluffs and Pacific Ocean. There are also lots of beautiful creatures – Island Foxes, Birds and Marine life. If you have a waterproof camera, you can catch photos of fish and crabs as well.